A winter coat is a big investment and if you live in a climate where winter lasts a few months, ideally you will have more than one such coat. But everyone needs to start somewhere! So, if you (I) were going to buy one coat, what would it be? Before we unpack this question, a few ground rules. Your coat shall be made of wool. In a perfect world, the wool would be cashmere or at least have some cashmere or camel-hair in the mix. If possible, the coat should be inter-lined with Thinsulate (miracle substance) which will provide great warmth and no bulk. If you find a beautiful cut, perfect in all respects except its buttons, you shall find replacement buttons for it and have a tailor sew them on for you. Make sure that the buttons are anchored by buttons on the reverse (inside) of the coat; it will minimize stress upon the fabric. Setting aside the question of the particular style (reefer, swing, funnel neck, cocoon, etc.) of said coat, there are three basic choices that must be confronted: color or neutral; short or long; roomy or svelte. Despite the high level of uniformity coming out of style handbooks on many topics (white shirts! ballet flats! trench coats! ), opinions on winter coats are varied and contradictory. Here’s what I think. Color v. neutral. If I could only have one coat, it would be black or a dark charcoal grey. But I am, nevertheless, a huge fan of the brightly colored winter coat, because what is more cheering on a bleak, cold day (visualize dirty snow on this sidewalks) than a jolt of color? Practically, the choice between a neutral and a color should be determined with reference to your own clothes. If you generally wear black, dark grey and other neutrals, a brightly colored coat will complement your wardrobe. But if you wear a variety of colors, a black or charcoal coat will harmonize with everything you wear. And now to confuse the issue, I will posit that camel is an excellent choice if you want something neutral, but less funereal than black. Short v. long. If I could only have one coat, I would chose a long one — for both versatility and warmth. 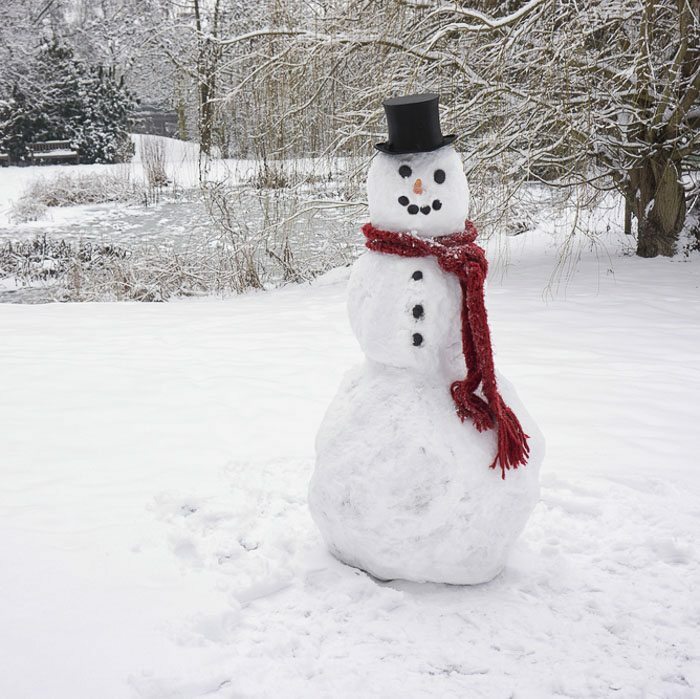 Nothing is smarter than a fitted, single-breasted, knee length coat, but it’s not very warm when you are wearing a dress or skirt. Why is she showing us short coats when she just advised us to buy a long one? I am showing them because they are beautiful! And, if you never wear dresses, a short coat might suit you perfectly. Are you suffering from decision fatigue yet? It’s real. Should you ever face a parole board, I hope you draw a hearing in the morning — because by afternoon, the status quo will rule. Fitted v. Roomy. If I could only have one coat, I would choose a roomy cut that would fit over a suit jacket or bulky sweater. Here again, I am favoring practicality over chic. Or perhaps it’s giving preference to grace over chic. A beautiful loose overcoat worn over a suit is easy, elegant and mature. A fitted coat will look beautiful — until you have to take your suit jacket out of a bag (and what bag would that be?) and put it on at office after you’ve hung up your coat. That’s ok if the office is your office, but less graceful when you are at someone else’s office. Now, returning to the shape and cut of the coat . . . this choice will be determined in part by your body type and in part by what remains after you’ve made the decisions listed above. 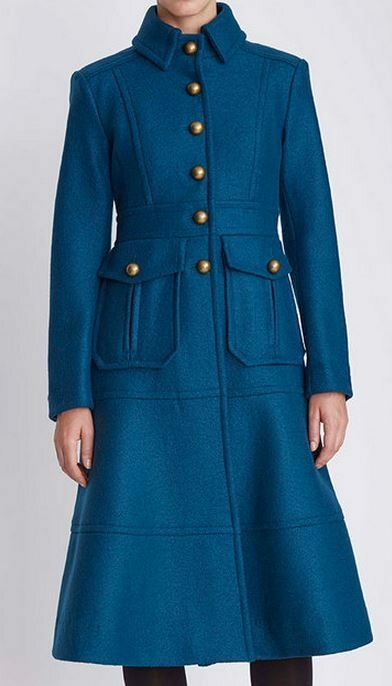 You should consult these historic You Look Fab posts for advice on the most flattering cuts for your body type: Coat-ology Part I and Coat-ology Part II. But I will offer two observations. 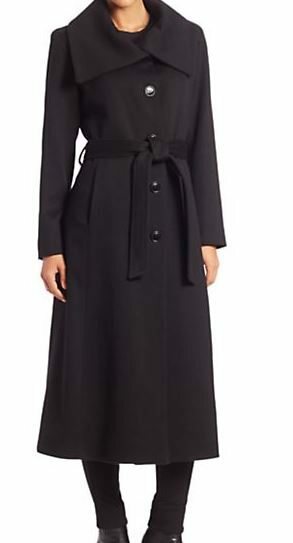 First, a single breasted coat may be worn gracefully buttoned and unbuttoned; the same is not true of most double-breasted coats. Second, a wrap coat may be difficult to close snugly; when it’s really cold, it’s nice to be able to button your coat up to your neck, if not your chin. If, however, you are likely to be pregnant or are prone to substantial weight fluctuations, the flexibility of a wrap style may be very appealing. 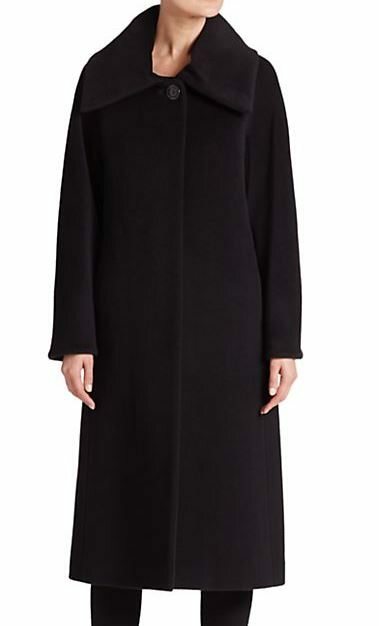 Labels that I really like for coats are Max Mara and Cinzia Rocca. Those impeccable Italians with their beautiful textiles. 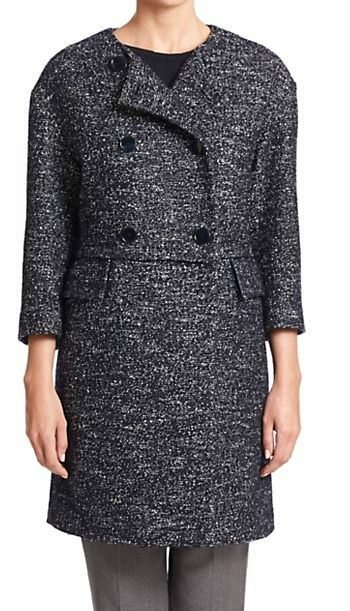 But I am also very fond of JCrew’s double-cloth coats (fabric made in Italy), which are an extraordinary value for the cost. (4) properly anchoring the buttons (as described above) if the manufacturer did not do so. Good luck! Coming soon is a treatise on hats, gloves, and scarves. All coats shown above are from Saks Fifth Avenue except for the Femme Fatale Trench, which is from Nanette Lepore. 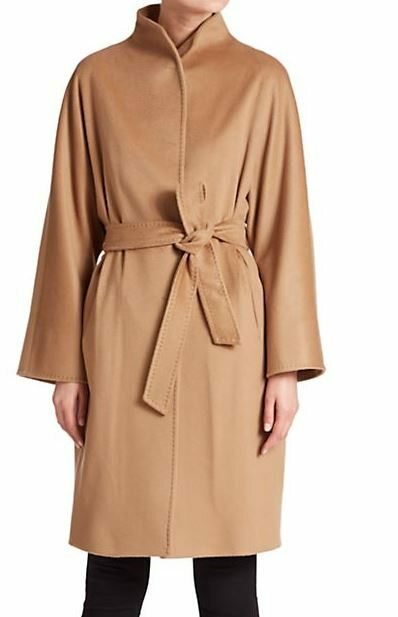 The Cinzia Rocca camel coat is lovely! Alas, I no longer live in a climate that requires heavy winter coat — the most I wear here is a cotton gabardine coat. But, this post is encouraging me to consider buying a proper coat for those few work trips each winter that take me somewhere cold. I agree that a roomy coat is more practical. Directrice, do you think the Cinzia Rocca camel coat might be sufficiently roomy if its not tightly cinched? Hi Rhizophora — I think the camel coat would be roomy enough. The only question is whether it would look bulky through the midsection with a suit jacket underneath. This question can only be answered by actually trying it, but I think it is worth trying (as long as everything can be returned). Good luck! Jodie — That coat is a work of art! Shouldn’t there be a branch in the decision tree that says, “Does this coat have three-quarter sleeves that will expose your wrists and lower forearms to frigid air, piercing wind, and flesh-numbing sleet? If no, move to the next item. If yes, BZZZZT—loop back to the previous step”? There is nothing to forgive! Come to The Directrice when you are grumpy and perhaps you will be cheered up. Here is the thing with the 3/4 sleeve: it wouldn’t do for your primary coat in a true winter climate. But, if you are in a milder place, or if you have more than one coat, the 3/4 sleeves do look very chic with a longer glove, as Sharla points out. (Thank you, Sharla!) See, e.g., photos of Jacqueline Kennedy in her day dress and coat dressed for the inauguration ceremony. I also have a cropped jacket with 3/4 sleeves that looks really great with a cable knit sweater (full length sleeves) and jeans. I like the coats you selected Directrice. The first one has a military air that I quite enjoy. I have a similar one in teal with pewter buttons. Since I usually dress in charcoal grey, black, or navy – it’s a nice pop of color on a dreary Oregon day. I also own a magenta/purple, a cobalt blue, and a dark denim winter coat. I’m thinking that red is the next frontier in a winter coat, if I get up the nerve. And yes, Sue has a point about 3/4 sleeves. I also have knitted long gloves to fit that bill. Sadly I live in Canada north of North Dakota (yes there are people who inhabitant a land further north than Fargo!) so I can rule out anything that isn’t down-filled. I did manage to purchase a lovely puffer coat this summer that features stitching in a chevron pattern that is super flattering so I count that as a win here in the land of ice and snow. I pair it with my Manitobah Mukluks (http://store.manitobah.ca/collections/mukluks/products/snowy-owl-mukluk) and a lovely touque and I am all set for winter! Stylish yet appropriate for our climate! Linda — Your Mukluks are fantastic. Fantastic. When I was a teenager, I didn’t think it was cool to wear a hat or boots in the winter, but as a mature woman, I can’t wait to pull out the cold weather gear and be toasty when the temperature drops.